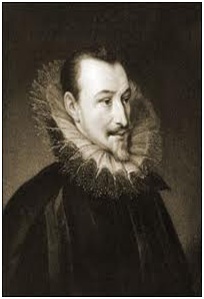 Little is known of Spenser’s Cambridge career, except that he was a sizar of Pembroke Hall, took his bachelor’s degree in 1572, his master’s in 1576, and left Cambridge without having obtained a fellowship. The shattered remains of the castle and land lie approximately 20 kilometres to the north of Glanworth Castle in North Co. Cork. The district appeared to have been held originally by the O’Keeffes then by the MacCarthys until 1347, at which stage the Lord Roche – Lord Fermoy took it over. It was then the Castle was built. It was held by them until the end of the Geraldine Wars in 1583. In the meantime Master Spenser was serving his apprenticeship as a ‘Planter’s Assistant in Dublin. As a clerk dealing with licences of dispensation he was able to use his position to obtain lands at nominal prices. 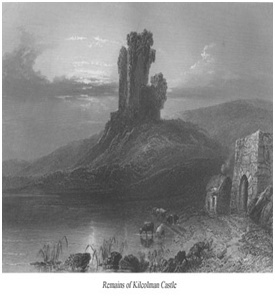 In the Desmond Rebellion he wrote ‘I saw such wretchedness as a stoyne hart would rue the same’ When the Roche lands became available he took his part in the Protestant plantation of Munster being awarded 3,028 acres in 1586 which included the castles of Kilcolman and Reeny. He was in constant conflict with Roche – Lord Fermoy, who wanted this part of his estate restored. Bagwell’s Ireland under the Tudors wrote:—“Spenser had Kilcolman and 4,000 acres(3,028 acres) allotted to him, but he complained the area was much less. Less or more, he was not allowed to dwell in peace, and his chief enemy, Lord Roche, who accused him of intruding on his lands, and using violence to his tenants, servants and cattle. The poet retorted that the peer entertained traitors, imprisoned subjects, brought the law into contempt, and forbade all his people to have any dealings with Lord Roche and his tenants. An English settler named Keate asked Morris MacShane, one of Lord Roche’s men, why he had no fear of God; and it is sworn that he answered, * he fears not God, for he had no cause: but he feared his Lord, who had punished him before and would have his goods.’ Lord Roche was charged with many outrages, such as killing a bullock belonging to a smith who mended a settler’s plough, seizing the cows of another for renting land from the owner of this plough, and killing a fat beast belonging to a third, because Mr. Spenser lay in his house one night, as he came from the Sessions in Limerick. Ultimately the poet’s estate-was surveyed as 3,028 acres at a rent of £8 13s. 9d”. Philip Harold Barry (an offshoot of Barrymore Estate Barrys’ and Harolds’ of Limerick) took over the lands, strengthened and repaired the crumbling ruin in 1850.